…and it’s just one small piece of all that makes the upcoming release of Pixelmator 2.1 Cherry so totally exciting. Nice. But what about “authentic”? OH MAN. You mean I don’t have to email myself files and open them in Snapseed anymore? BRING IT PLEASE! I don’t understand @Micah M.’s comment but I like this feature. so I’m trying to find out if this will be pushed out as an update or will I have to purchase again? I don’t really want to wait but there’s no sense in buying now and having to pay to download the new version Too. 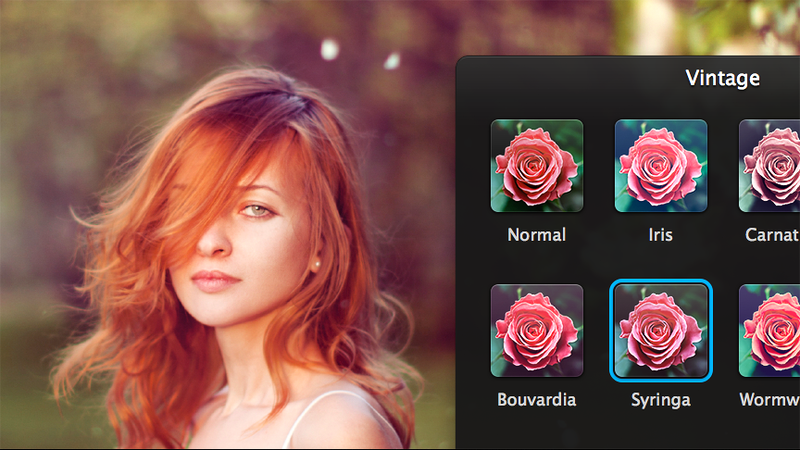 Pixelmator 2.1 Cherry will be a free update (including any other 2.X updates), as usually. Nice to have these effects, although for me these are not essential. I wish Pixelmator would have way better text formatting features: faux bold, faux italic, letter width and height, better multi-face font handling (if I apply Bold to Myriad Pro SemiCondensed typeface, it should look for SemiCondensed Bold and not just use Bold instead, or, if I apply italic to SemiCondensed typeface, it should look for SemiCondensed Italic, not Semibold Italic). Sliders would be good for letter and line spacing adjustments, similar to Photoshop interface — click on adjustment box and just move cursor aside to adjust setting in the adjustment box. Perhaps separate Type adjustment palette would be welcome, similar to Type palette in the iWork apps. And secondly layer effects… At least Drop Shadow, Emboss and Frame (line). Those things would be more practical in my workflow. That last comment about faux bold, faux italic, etc. THOSE ARE NOT ACTUAL FONT STYLES! All designers know that you never click the faux settings in any character palette. If the font you are using doesn’t have a bold face to it in the family, pick another font family that does. In reality, all font families have weights and styles—but some crappy free fonts do not. I never want to see these options and it drives me nuts that they are still in other layout programs. A great feature for 2.1 would be the ability to stop automatically reopening of files when you close pixelmator! Otherwise the features look amazing! It is pretty simple to Command W to close your files before quitting with Command Q. No reopening of files! Plus the W & Q are right next to each other. Where to download the beta? So… this isnt avaiable yet? Awesome and easy to follow tutorial! thank you so much! i looked for this on the app store but its not there is it online or something?